Game shooting: Northern Ireland may not have as many opportunites for game shooting as elsewhere in the British Isles, but in Baronscourt it certainly has one of the most beautiful. Situated in a valley at the base of the Sperrin Mountains, Baronscourt estate, all 5,000 acres of it, is something of a sporting paradise. Game shooting at Baronscourt, County Tyrone. After passing through the main gates I was met by a beater who pointed me towards the main house, and soon after I grabbed a glimpse of the impressive Clock Tower and Governor’s Lodge – a building that is part of the estate’s stable yard and which dates back to 1890. I soon arrived at Barons Court – the main house and seat of the Duke of Abercorn’s family since 1610 – to be met by my host, Jamie, the Marquess of Hamilton. 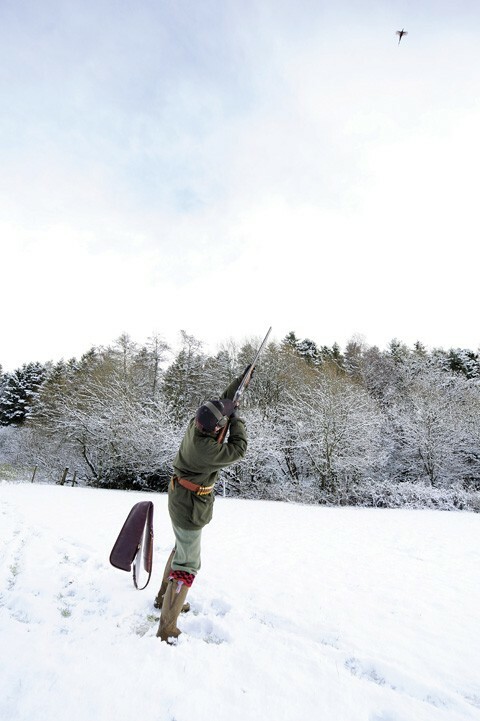 “There has been game shooting at Baronscourt since the mid-1800s,” said Jamie. “It is something we have always nurtured under our own management. This includes retaining, as best as possible, our own bloodline of pheasant. We’re very lucky in terms of the topography, which really lends itself to sporting birds. Sammy Pollock, our headkeeper, is assisted by his son, Stephen, and daughter, Jeanette, as well as a wealth of other locals who help on shoot days. 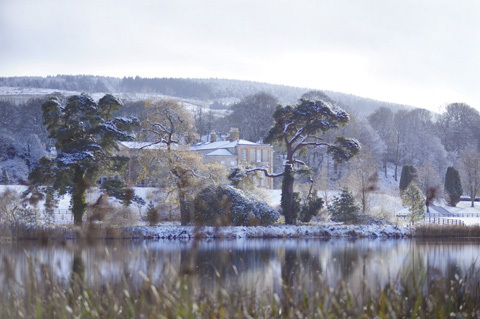 A stunning winter scene at Baronscourt. “Conservation is also very much to the fore. Every decision is carefully thought out in terms of the impact it will have and the benefits that can be drawn from it. And this is not only in terms of game shooting – a Laurent Perrier Award for wild game conservation in relation to the management of our wild herd of Japanese sika, and the Royal Forestry Society’s Duke of Cornwall Award highlights this.All of Baroncourt’s days are managed by Jamie – a personal and knowledgeable touch which ensures everything runs smoothly. 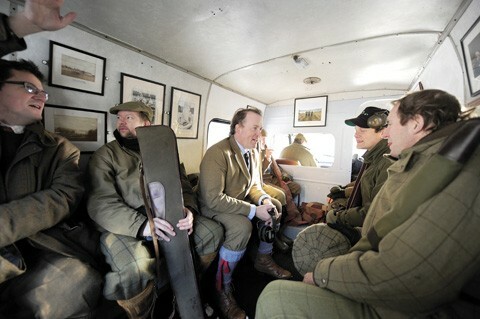 The estate is fortunate to offer a variety of game for its discerning clients. A call to the Byturn, the first drive, marked the end of our conversation, and it was then to the gunbus – a fine specimen adorned on the inside with framed photographs of previous shoots and family members from years gone by. Driven along by helper Robert Freeborn we soon found ourselves in a snow-strewn landscape. I found myself behind Lord Iveagh from Elveden estate. Resplendent in his family’s Guinness tie, it wasn’t long before he was sampling some of Baronscourt’s best. The walls of the gunbus are adorned with photographs of previous shoots and family members. As snow clouds loomed in the distance, pheasants took flight over the line of guns, their rich colours, reflected by a glowing winter sun were stark against a darkened sky. They came in a steady trickle and the drive lasted long enough for each gun to get a good share of the sport. Elevenses in a log cabin followed McKelvey’s Kale – a very scenic drive that backed onto one of the estate’s three lakes and the main house. The team tucked in to sausage rolls, soup and a nip of sloe gin around the warmth of a log fire. Once suitably fortified it was on to the Spinney. With lunch looming, there was a treat in store for the guns – a duck drive. Not only was it a great way to end the morning’s game shooting, it provided uninterrupted sport as the birds lifted in a frenzy of flight. 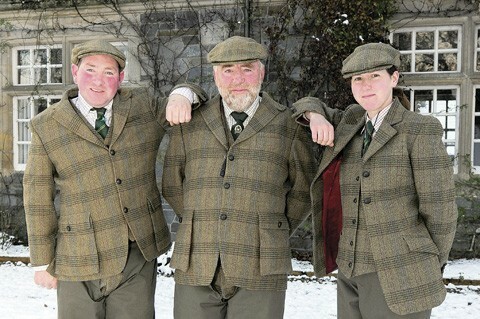 Headkeeper Sammy Pollock (centre) flanked by his underkeepers, son Stephen and daughter Jeanette. Over lunch I bent the ear of headkeeper Sammy Pollock. Son and daughter Stephen and Jeanette joined Sammy when they left school. And, apart from enjoying everything ‘outdoors’, Jeanette also has an interest in water colour painting, something she does on commission. And Sammy even has his other son, David, and David’s son, Adam, helping out on shoot days too. For Sammy and his team, conservation, as with Lord James, is key, and he realises that for game shooting to work it has to be carried out in conjunction with managing the land correctly. 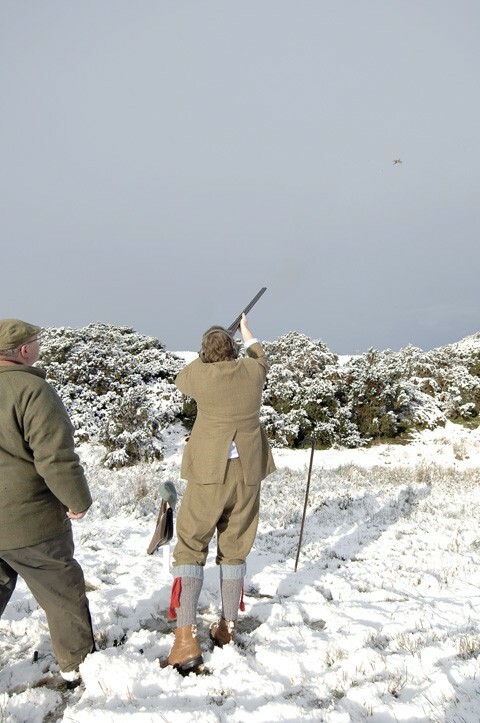 There is superb shooting on offer at Baronscourt but they are careful not to overshoot the land. We closed the day with Ramps. With the stunning house in the background, the guns saw good birds before retiring for a cup of tea, and for those staying the night, something a little bit stronger. For me, it was a trip back to the airport and a head full of memories from a great day.